Get updates from the gallery about art exhibitions, gallery events and general art news. Select which lists you would like to sign-up for. 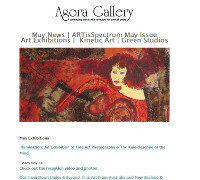 Our newsletter is the best way to stay in touch with what is going on Agora Gallery all year round; each email provides a summary of the news and successes of the previous month, whilst also looking ahead to the coming events of the next. 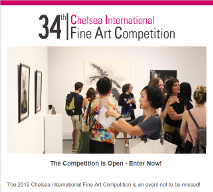 Exhibitions, artists and the latest news are all included, and information about other art-related events or venues may be of particular interest to those living in or visiting the New York area. The newsletter is usually sent out once a month. Our invitations keep you updated about upcoming exhibitions in the gallery, letting you know about the exhibition itself, the dates and times of the reception for the exhibition, and, of course, inviting you to take part. Receptions are always exciting events, enlivened by the presence of art enthusiasts, professionals and artists, in particular those whose work appears in the exhibition itself, often supported by their family and friends. 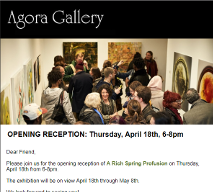 Agora Gallery's announcements are an excellent way to stay aware of important opportunities and breaking news in the art world, including juried competitions. The content of the announcements is generally international, making it appropriate for artists all over the world, and particularly those who wish to participate in the global art scene. Announcements are sent 4-6 times a year.